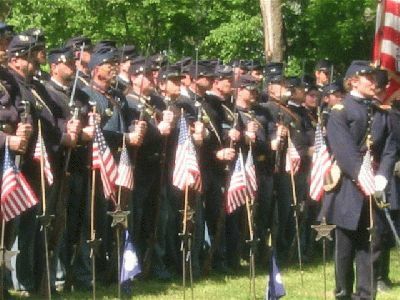 Members of the 1st and 2nd Minnesota Inf\'y and Battery I at Memorial Day ceremonies at Lakewood Cemetery, Minneapolis, Minnesota. The two small blue and white flags are 1st Brigade, 2nd Division, 2nd Corps HQ flags we placed at the grave of each member of the original First Minnesota. Photo by Thomas Lockman.